Archaeologists believe that the first people into North America crossed via a land bridge from Asia to the Yukon some 10,000 to 25,000 years ago. The Yukon remained ice-free during the last ice age and provided a haven for many animals and humans fleeing from colder regions. The Yukon River was a natural highway for Yukon First Nations people who subsisted on hunting in the spring and fall, and summers, fishing for salmon. Yukon River in the mid 1800s, the Hudson’s Bay Company began to move into the Yukon interior, drawn by the prospect of furs. Trading posts were not warmly welcomed by First Nations people who saw this incursion as a threat to their monopoly of trade within the area. Threats to these posts saw a retreat of Europeans and the Hudson’s Bay Company from southern Yukon. 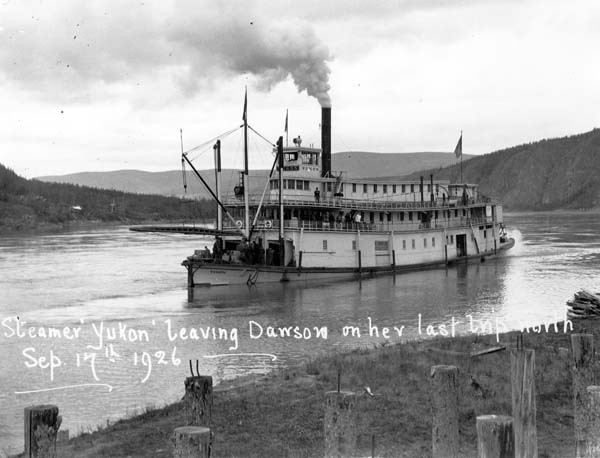 Then, in 1896, the discovery of gold near Dawson City altered the history of the Yukon River forever. It became the main route for gold rushers as they floated in an armada of over 7,000 boats to their dreams of adventure and wealth in the Klondike gold fields. Over the next fifty years towns and villages sprang up along its shore and paddle wheelers carried people, supplies, and natural resources up and down its waters. When modern highways were introduced into the region in the 1950s, the river became redundant. Homes and entire villages moved to locations closer to the roads and the Yukon River was allowed to return to its natural state. Yukon comes from the Gwich’in meaning “great river”. It begins in Marsh Lake in the Yukon and empties into the Bering Sea, in Alaska, some 3,185 km (1,980 mi) in distance. were the main lifeline on the river. The building of Klondike Highway between Dawson and Whitehorse resulted in the end of the riverboat era. the longest canoe/kayak race in the world is the Yukon River Quest between Whitehorse and Dawson, held annually in the summer . The winners of this 740 km test will complete the race in about 40 hours. Dawson City, founded in 1896, as the center of the Klondike Gold Rush, was named after Dr. George M. Dawson, the Director of the Geological Survey of Canada. – during the height of the Klondike Gold Rush, over 30,000 people populated the town. This briefly made it the largest town north of Seattle and west of Winnipeg. Dawson was capital of the Yukon until 1953.